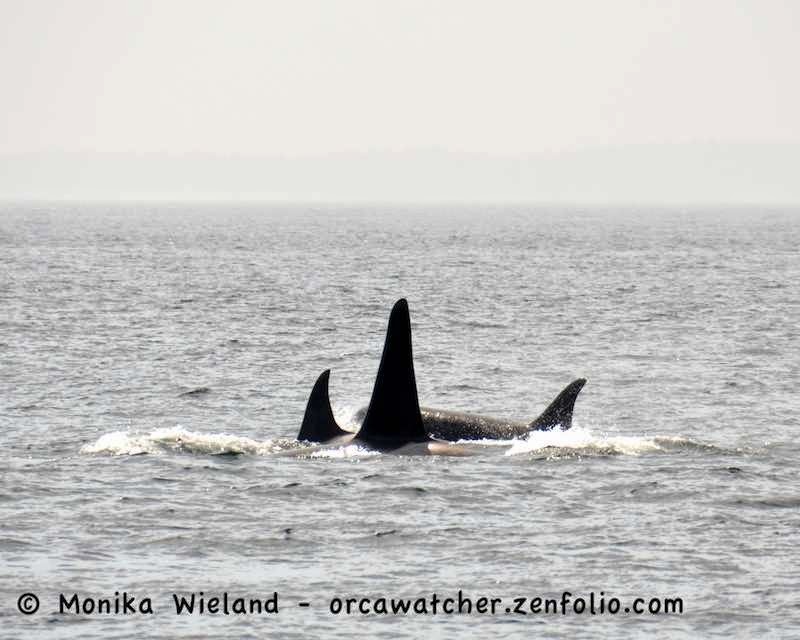 On Tuesday the 29th the whales happened to cooperate almost perfectly with my half-day work schedule. 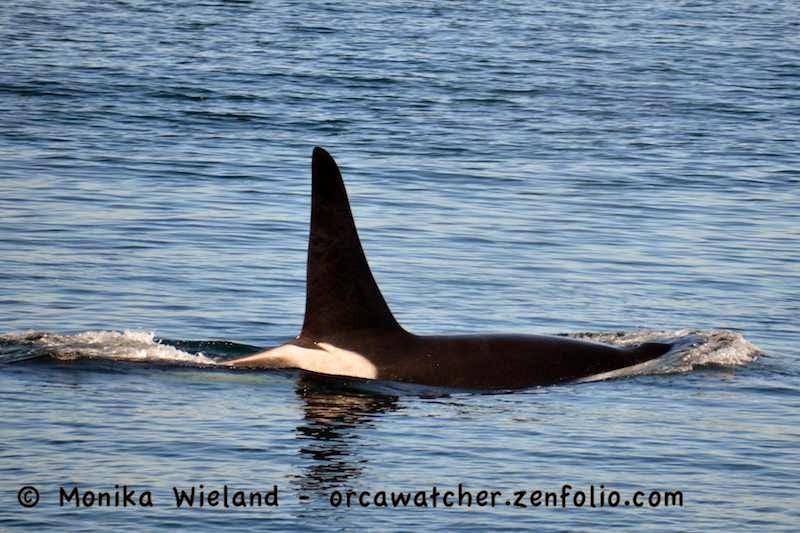 I got out to Lime Kiln early afternoon in the middle of a passby as parts of all three pods headed north. 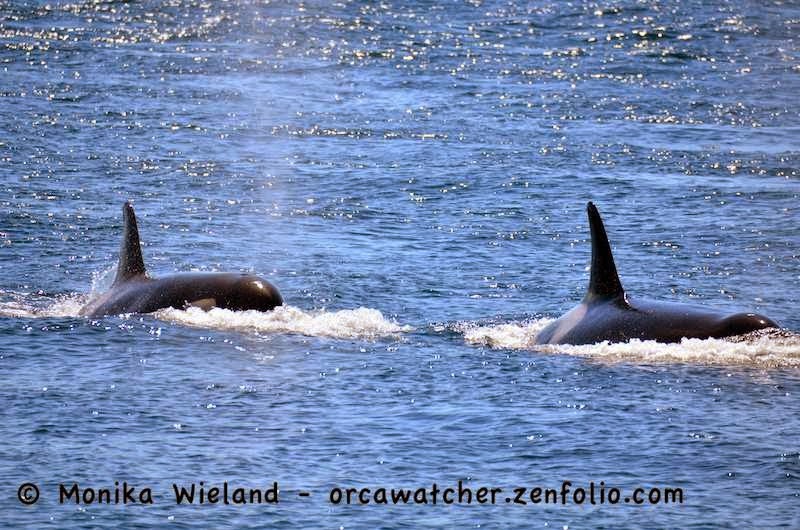 While I did miss J2 Granny, I was there for what ended up being the closest groups - again there were whales right off the rocks! 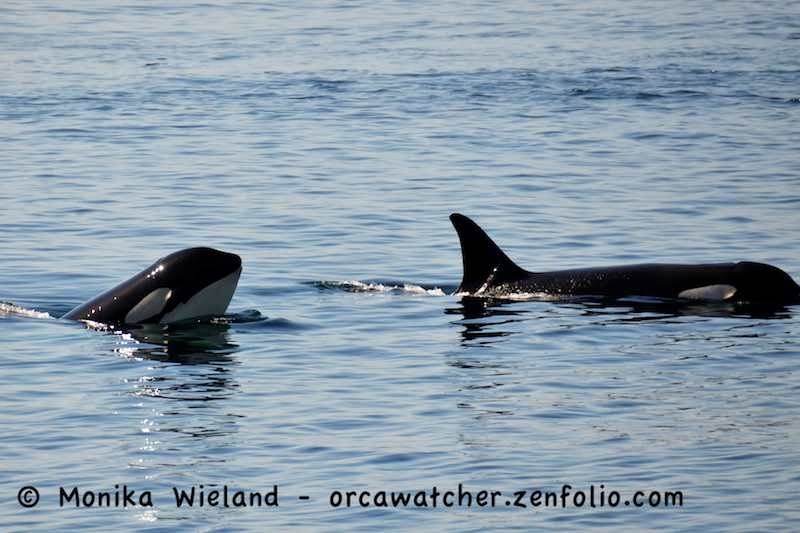 J37 Hy'shqa and calf J49 T'ilem I'nges have been very photogenic whales this summer - at least I've had lots of opportunities to photograph them! 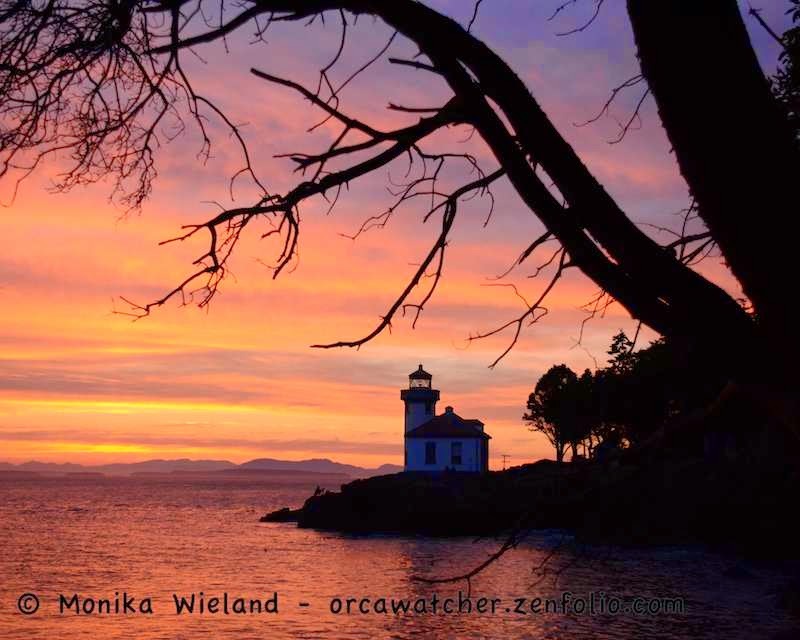 If you're wondering about the names, all the descendents of J14 Samish are given names in traditional naming ceremonies by the Samish Indian Nation. 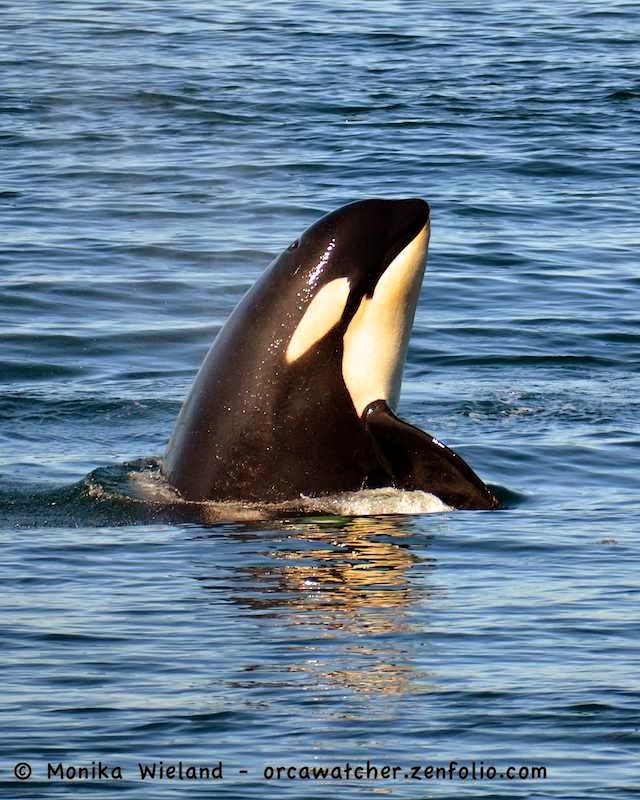 Hy'shqa is J14's daugher, and her name means "blessing" or "thank you". 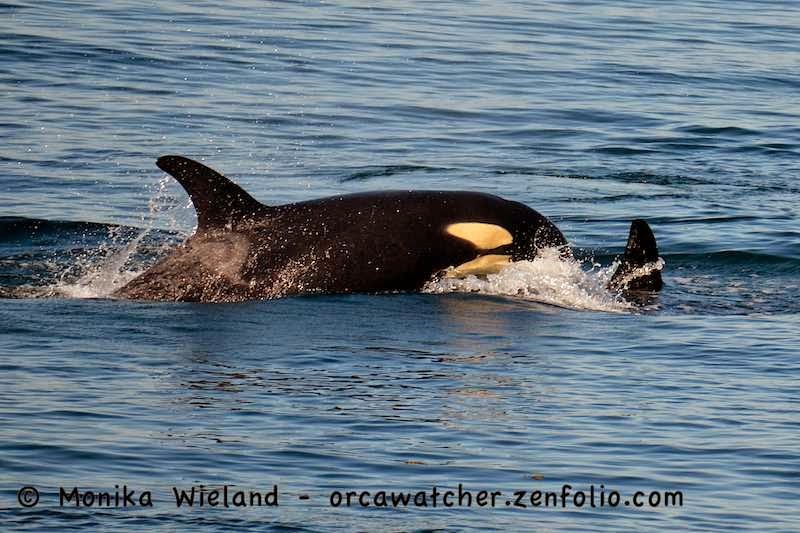 T'ilem I'nges is J14's first grandchild, and appropriately, his name means "singing grandchild". 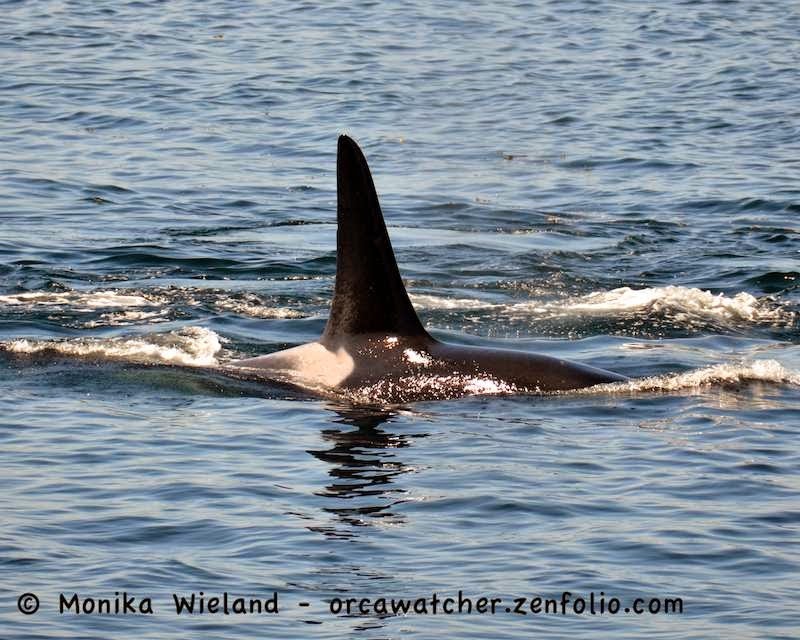 Following the K14s were three of the K12s, and they got up to just past the lighthouse before stopping and milling for a while. 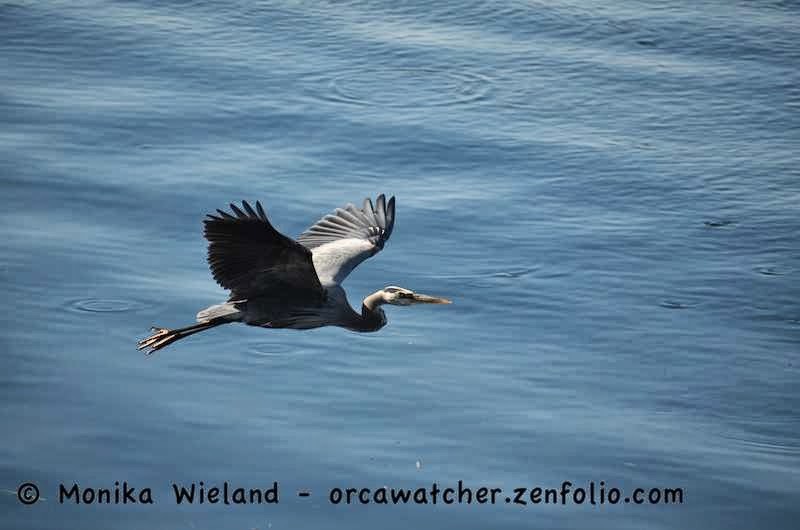 They eventually headed back south, to join up with many more whales there were still south of Lime Kiln, and a few Ls went south later to join them. 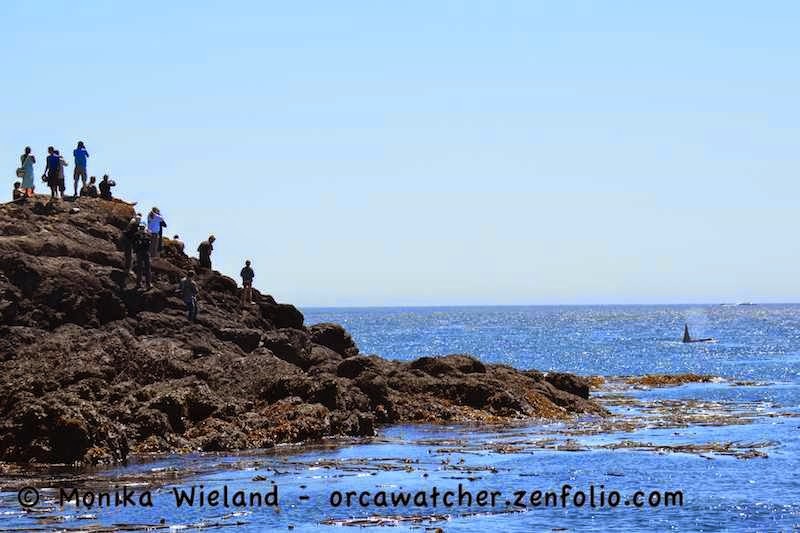 I was again at Lime Kiln waiting for them to approach, and I was blown away by the number of people at the park also patiently waiting for these four whales to arrive! 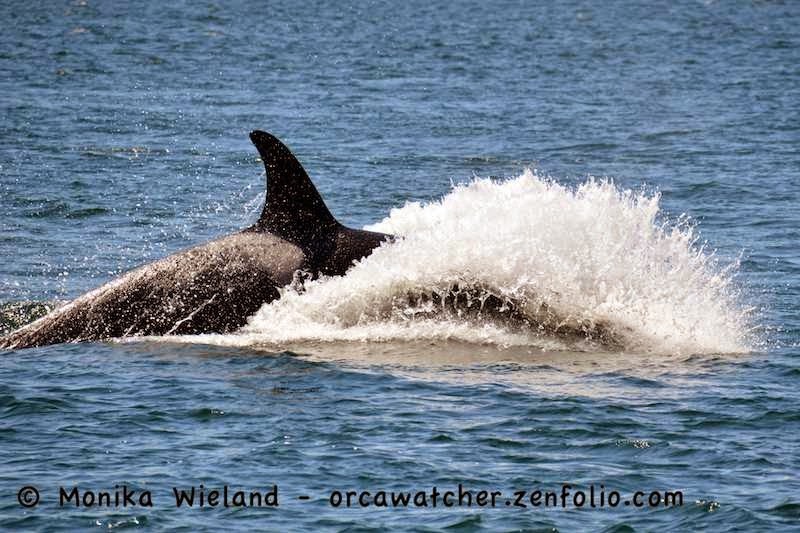 Bucking a strong flood tide, the whales made very slow progress, but dozens of people stayed out in the harsh sunshine and chilly wind waiting and waiting and waiting. 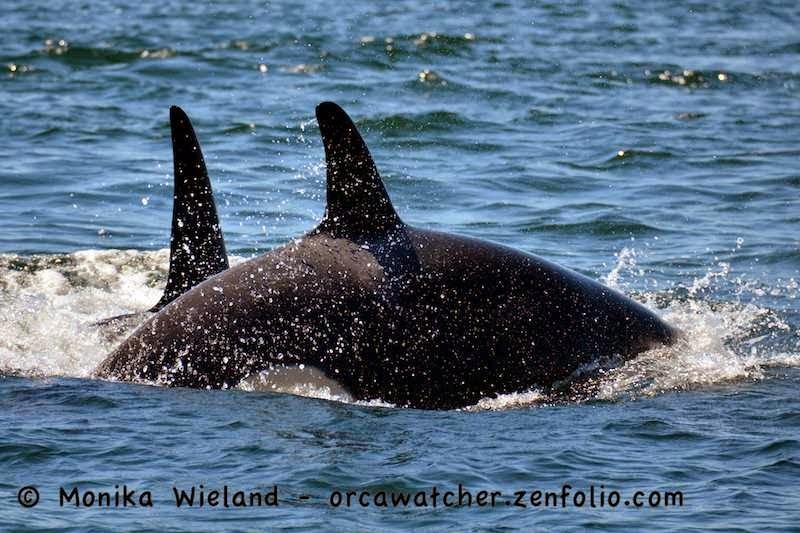 They were finally rewarded, as K14 Lea and her three offspring arrived, and slllllooooooowwwwly made their way south. I think it took them about two hours to really pass by Lime Kiln. 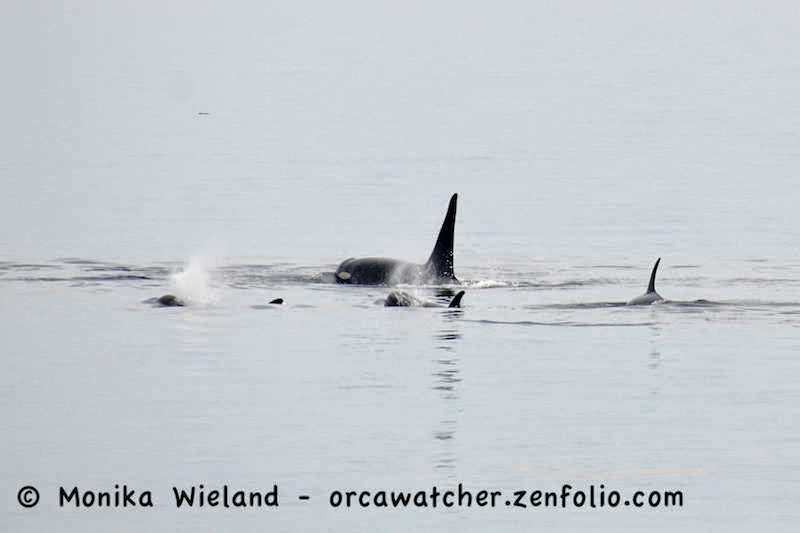 So since J-Pod arrived on May 31st we've had all these different groupings of whales coming and going, with different numbers and different whales here all the time. 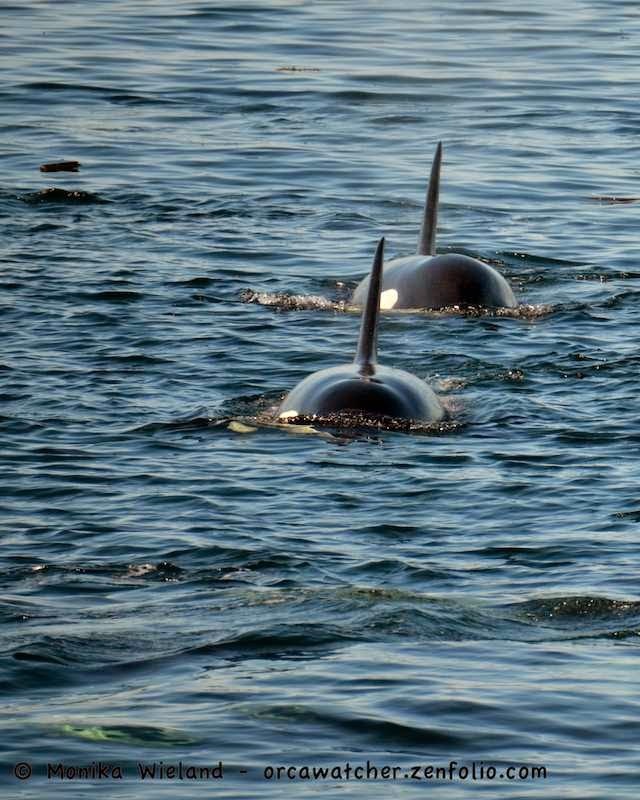 I'm convinced their presence or absence ultimately has to do with fish, but I know they are socially and culturally complex animals, so their travel routes are probably not simple to explain. 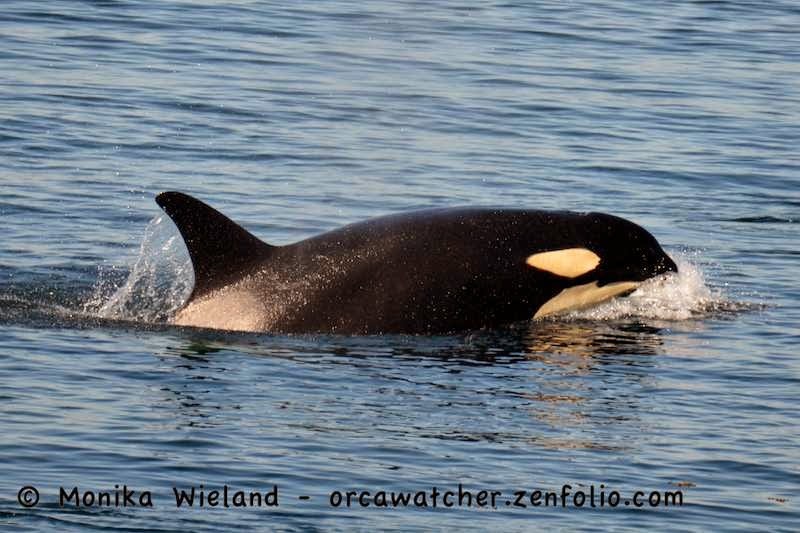 Still, I was curious just how well the number of whales present this year has been relating to Chinook salmon numbers, particularly the Albion test catch fishery that has been receiving so much attention from local whale watchers this season. That meant tonight it was time to put my data mining hat back on and see what I could come up with. X-axis shows the number of whales present in inland waters (ranging from 0 to 69, the most whales we've had "in" at once this year); Y-axis shows the Albion test fishery catch per unit effort value, which corrects how many fish they caught that day by how much effort they put into trying to catch fish. I added a blue trend line. The R-squared value, which is a statistical measure of how well data fit a regression line, is .23 - not excellent, but there's definitely some trend there. 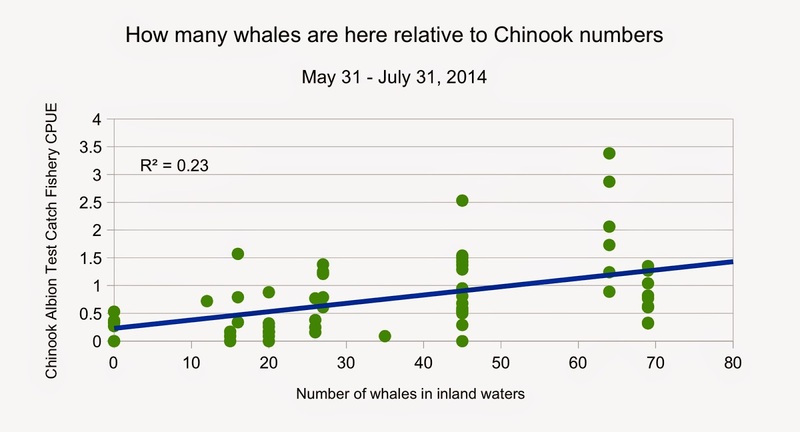 Makes sense - this graph basically says when there's more whales around, there's usually more fish around. What the above graph doesn't capture, however, is how things have played out on a daily basis over these last two months. I wanted to see how the two values compared on a daily basis from May 31 to July 31, so this graph shows each value as it's own color on a bar graph. The X-axis takes us from May 31st to July 31st of this year. Number of whales present in inland waters (or my best estimation of this number) is indicated by the blue lines and reference the left Y-axis. 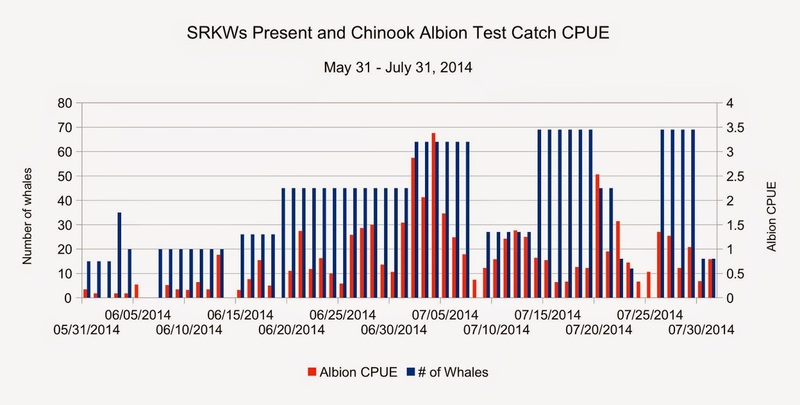 Albion Chinook test catch CPUE numbers are shown in the orange bars and values can be read off the right Y-axis. 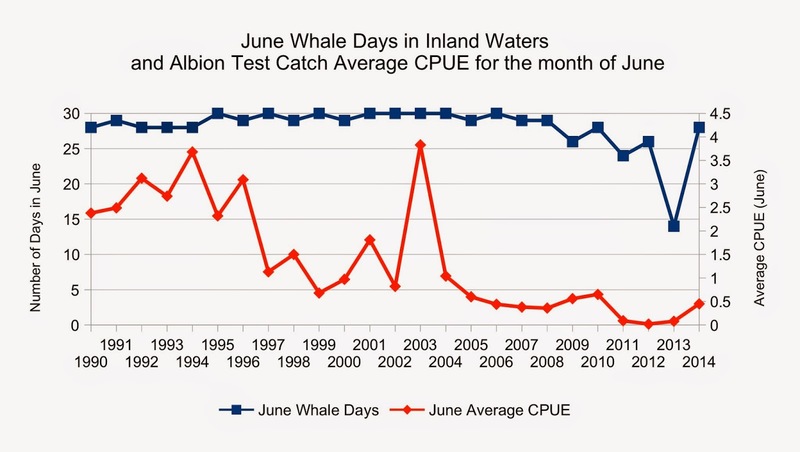 Again you see a faint trend of what you would expect - higher CPUE numbers generally translate into more whales present. 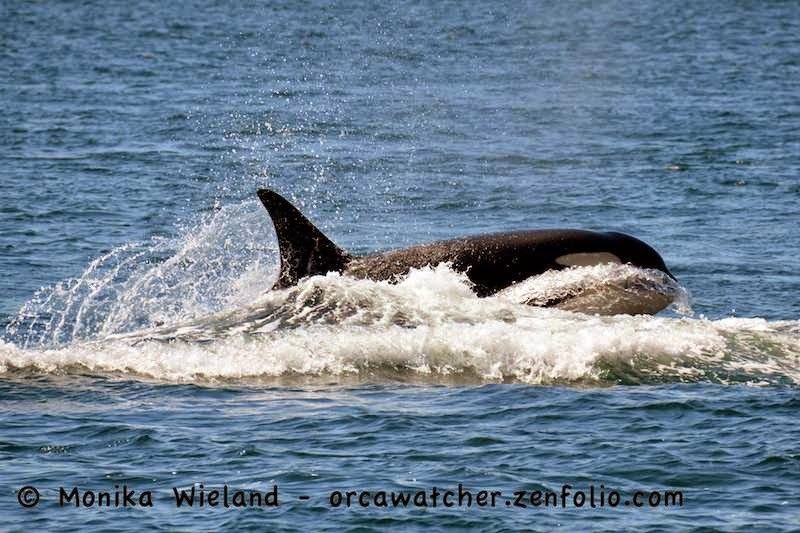 The whales were only gone for about three days, but it sure felt like a lot longer than that! It was with much excitement we all greeted the news that were "residents inbound" on Saturday evening. I went out and met some friends, hoping to see them. 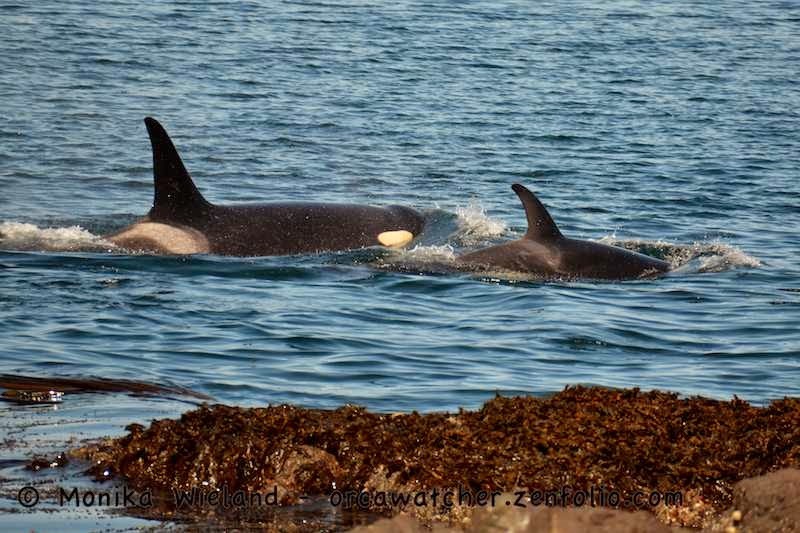 The first whales that reached San Juan Island - K-Pod - hit land at about False Bay and went south. 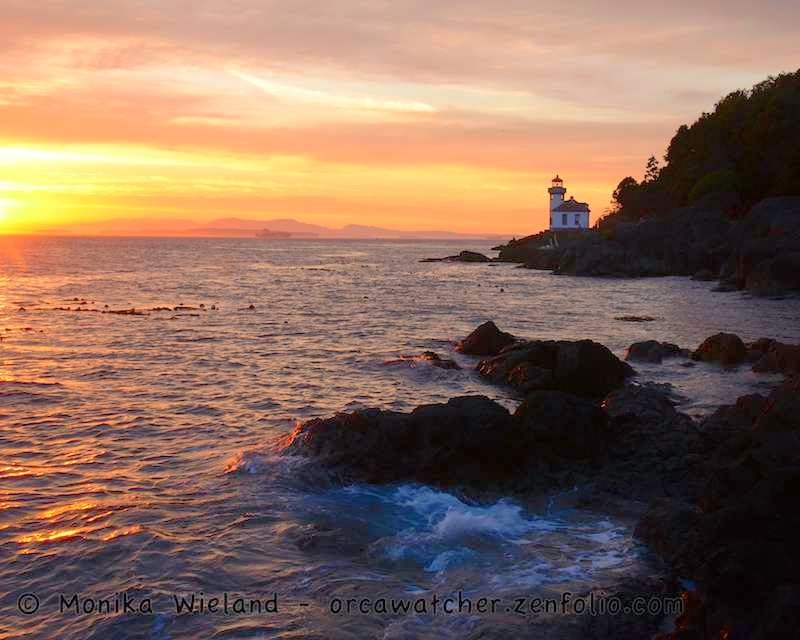 We were all ready to call it a night when we noticed one of the boats heading home to Victoria stopped in the middle of the strait. 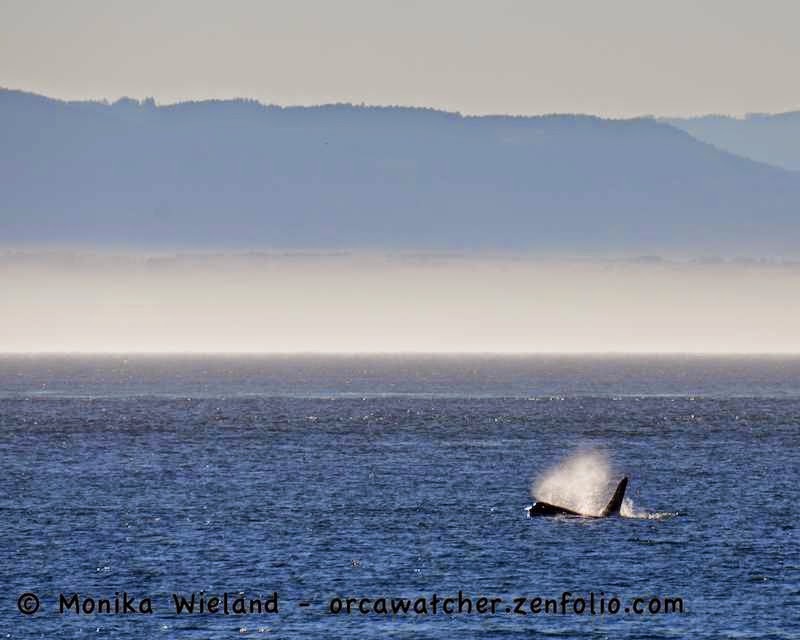 There were more whales out there! 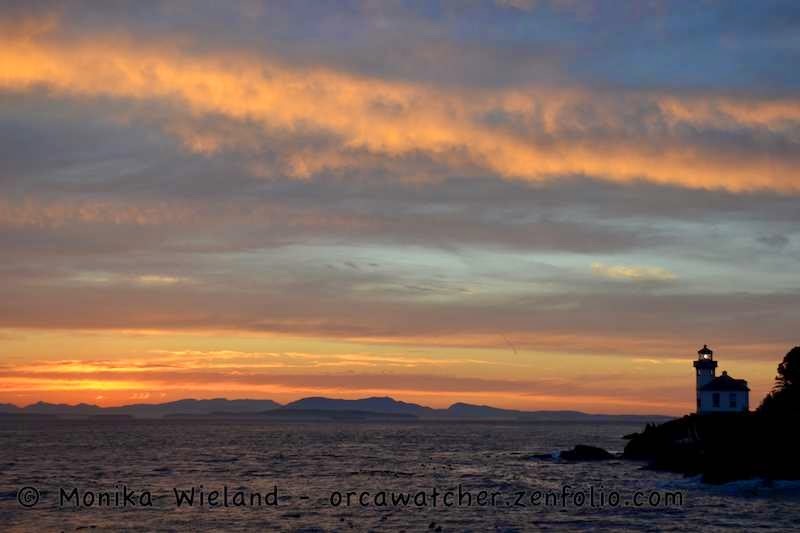 After watching the sun set, we went to Lime Kiln as some L-Pod whales made their way slowly north in the almost-dark. There wasn't enough light for photos, but I shot this short video with my iPhone to capture a little of the feel of the moment. 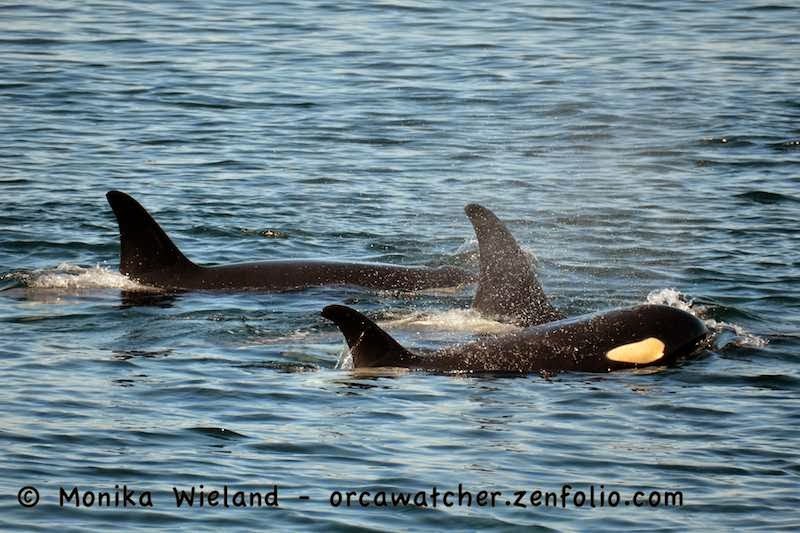 Blackberry was traveling with his sister J31 Tsuchi, K27 Deadhead, and Deadhead's calf K44 Ripple. That's one thing I love about superpods - it's always so interesting to see who associates with whom when everyone gets all mixed up! My prize shot of the morning - a gorgeous spyhop from K27 Deadhead. Prints available here. 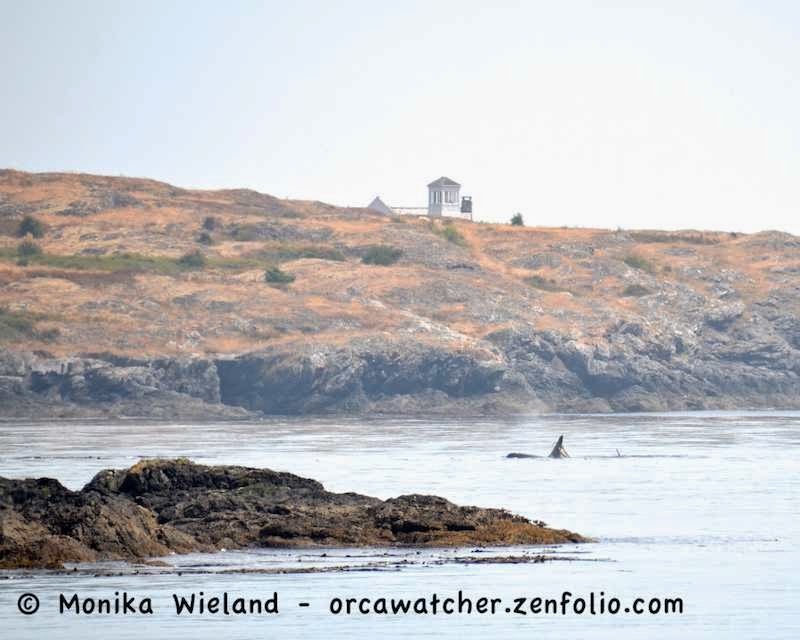 You would think after all these years I would have seen whales from just about everywhere in Lime Kiln, but not so! I usually go to one of a few favorite spots, but on this morning decided to try watching from a new vantage point. 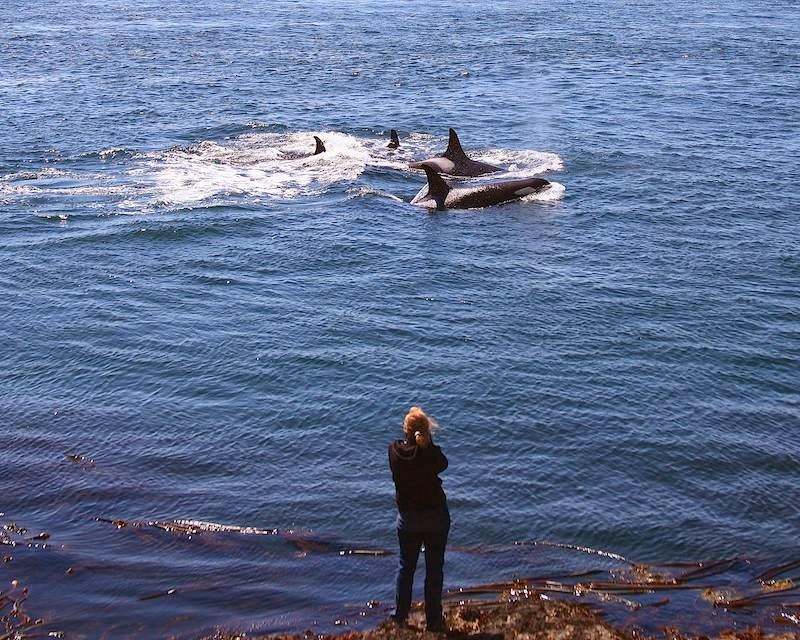 It led to some different looks, particularly when some whales circled back to come closer to the kelp. 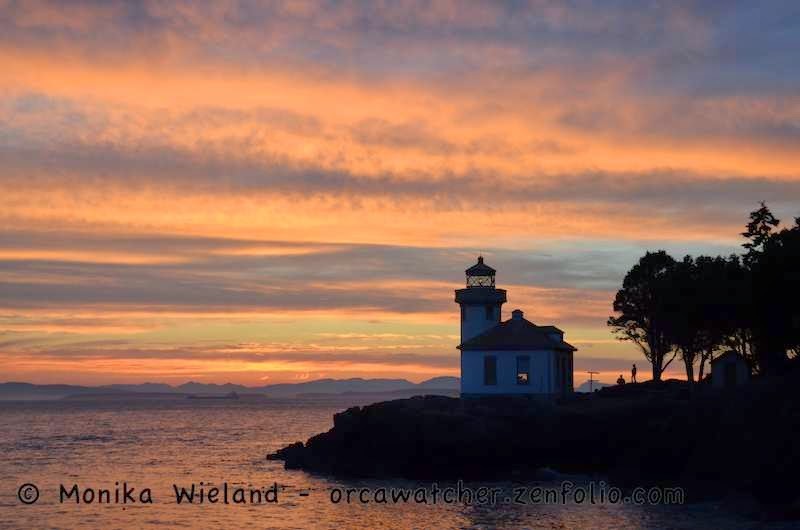 After every group of whales, we'd look south, and see more blows coming! 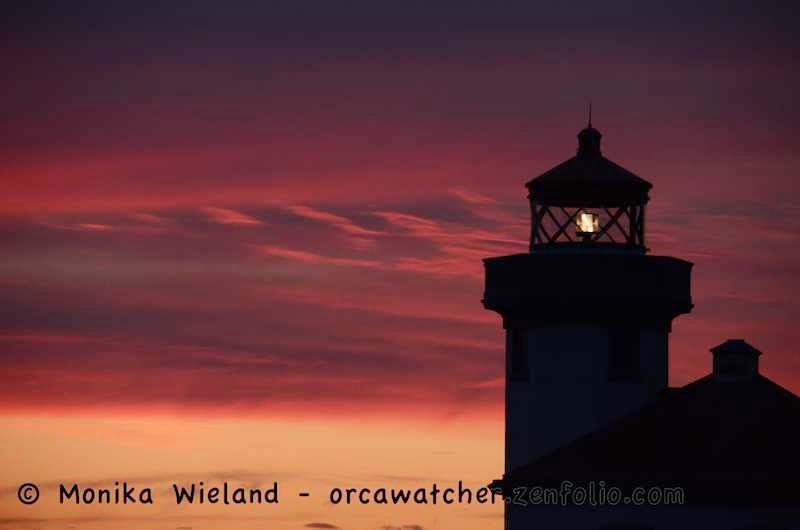 It was just wave after wave of whales! 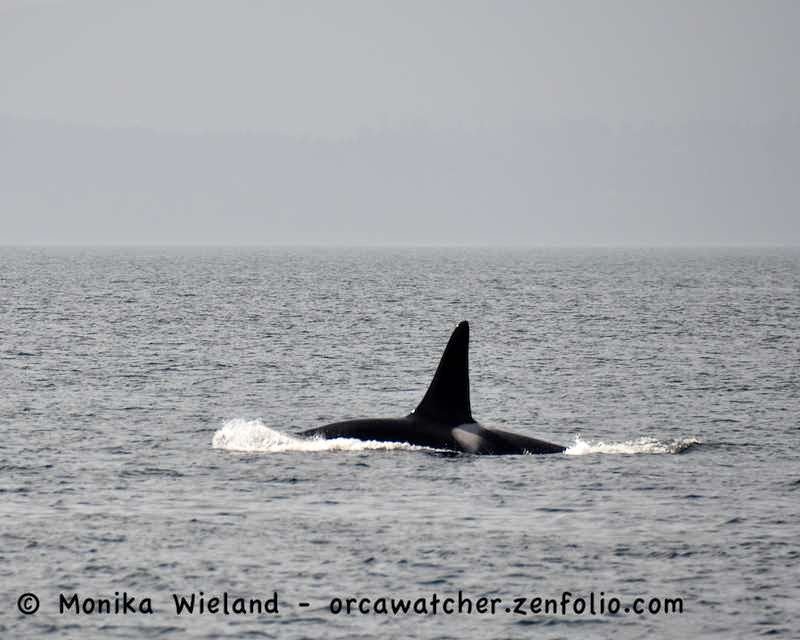 I was really surprised when some unusual whales popped up - the L54 sub-group! 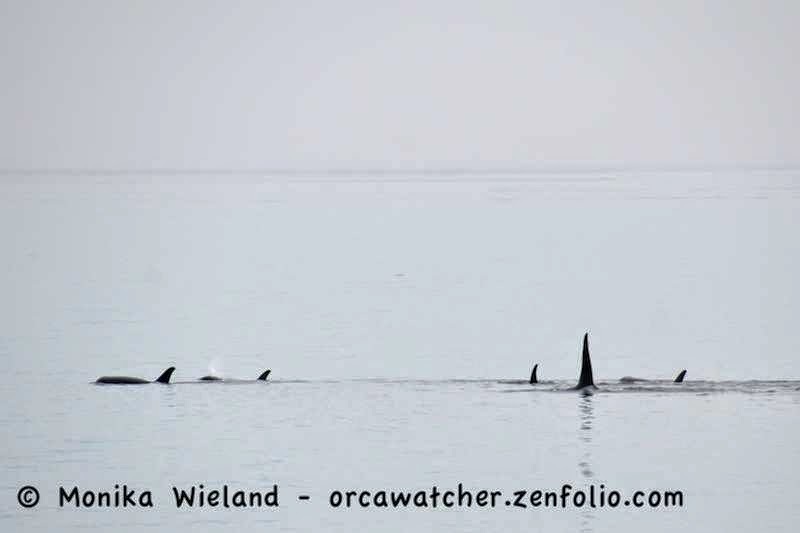 This small group of L-Pod whales, for whatever reason, visits inland waters a lot more rarely than the rest of L-Pod. 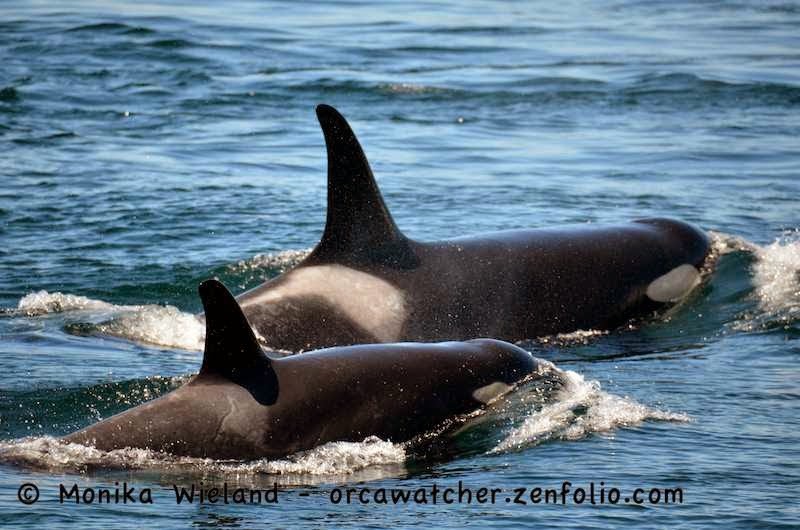 This was their first time "in" this season, actually, though they had been seen off the outer coast earlier this year. 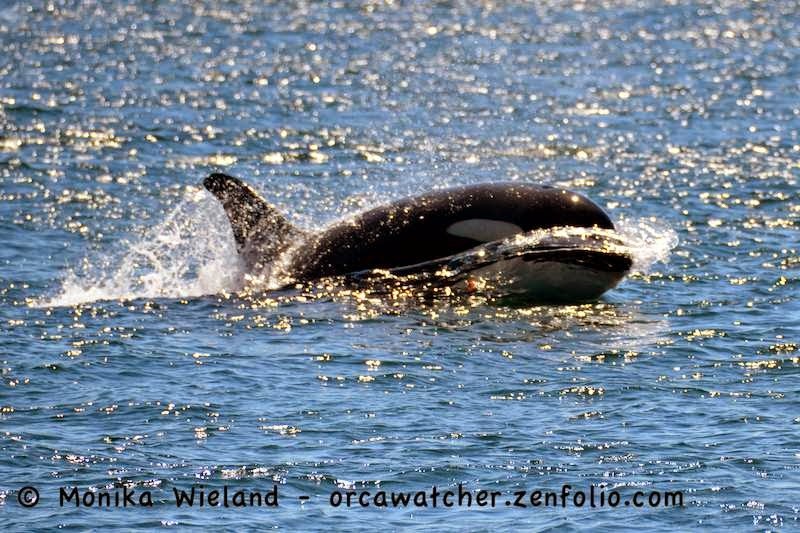 It was really nice to see them, and led to some of the best pictures I've ever gotten of some of these whales! 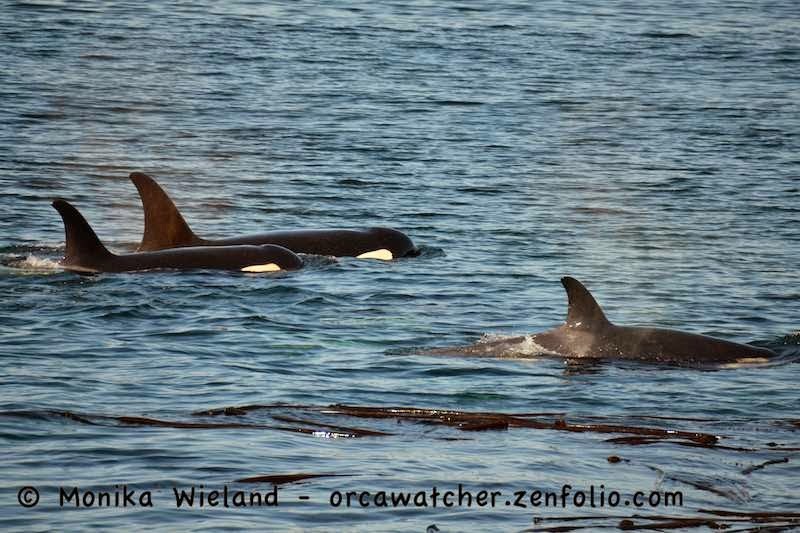 And it STILL wasn't the end - there were more L-Pod whales after that (as well as other groups way offshore during this whole time). 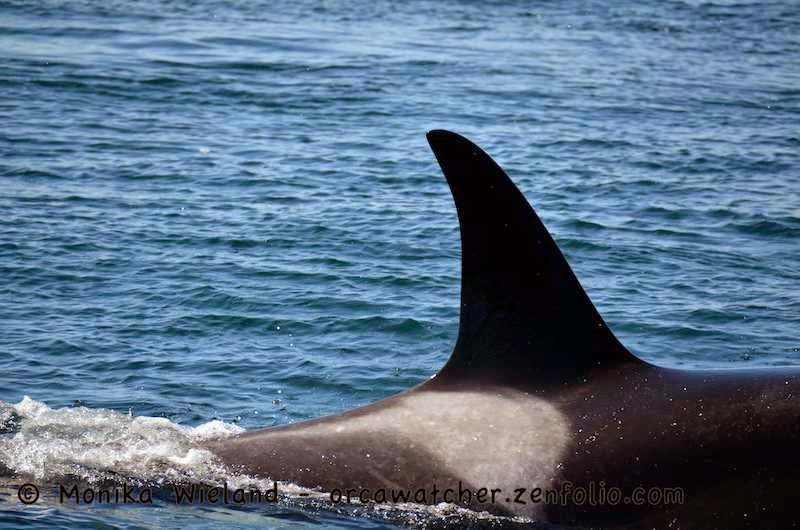 I determined that it looked like all the Southern Residents but the L12 sub-group were present, so that's about 69 whales! A lot of confusion followed however, as small groups went north and south and north and south (mostly not by Lime Kiln, but a few did), that by the end of the day no one was entirely sure who ended up where. But really, it didn't matter, because they stayed, and they were everywhere! 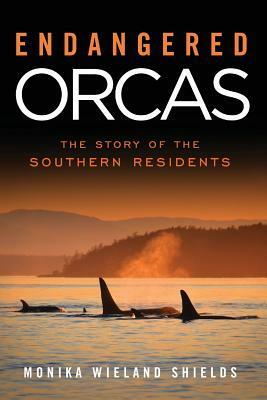 Number of days Southern Residents were in inland waters (blue) with data from The Whale Museum's Orca Master data set (1990-2012) and Orca Network sightings reports (2013-2014). Average catch per unit effort (CPUE) for the month of June based on test catch data from the Albion Chinook fishery in the Fraser River. First of all, many of us have called this summer "just like the good old days", and that statement is somewhat substantiated by the graph. 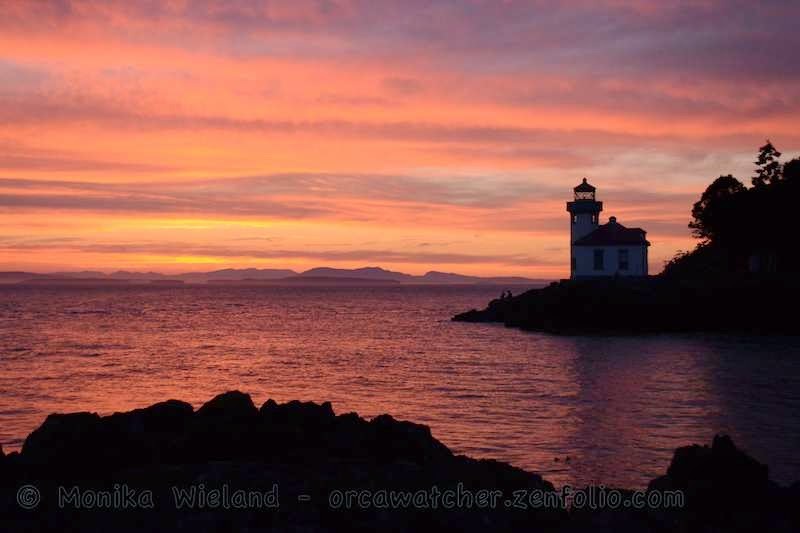 Historically, there were Southern Residents in inland waters between 28 and 30 days of June each year, until about five years ago when those numbers started to dip. Not surprisingly, last year was the worst, with Southern Residents around only 14 days in June. This year, with 28 days of Southern Residents in June, really was like the good old days. It's important, I think, to note that one thing this graph doesn't capture is how many whales were around. 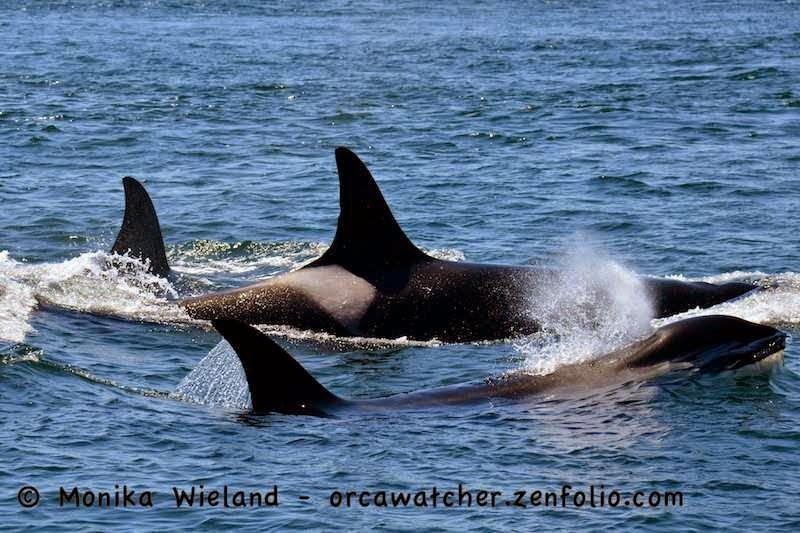 On some days in the 90s, when all three pods were around and the population was higher, that was more than 90 whales. 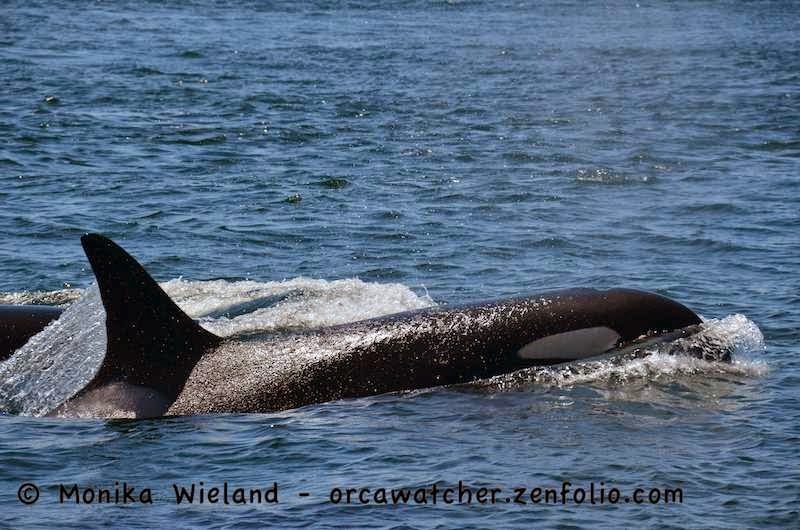 Last year, some days in June the only whales here were the three L22s. Both of these examples counts equally as a "whale day". But the data is still interesting, especially with last year's data point. As for the salmon data, well, we're all grateful this is a better Chinook year than last year, but when looking at it in context it's still a pretty dismal compared to what we used to experience. It's no coincidence that the last "peak" (if you can call it that, it's so low) was in 2010. 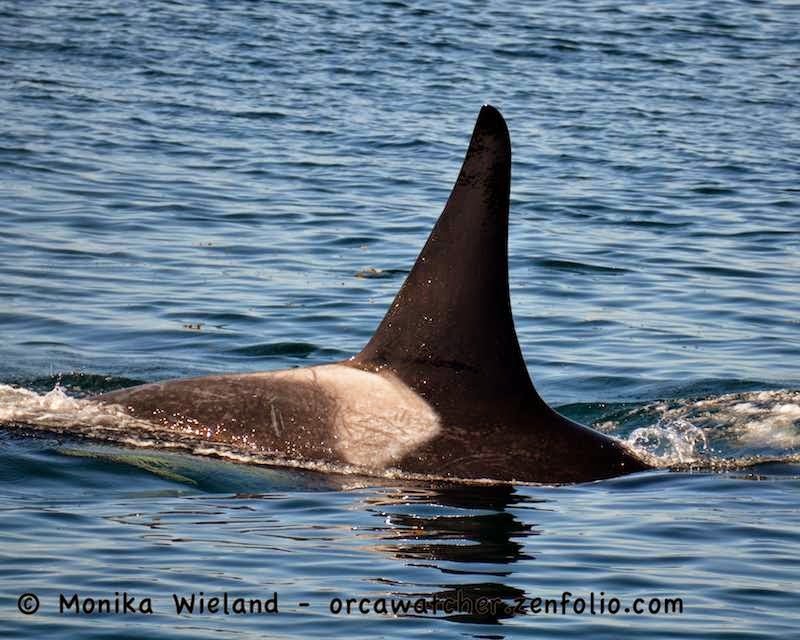 Chinook return four years after they're born, so it's the higher numbers from that year that are leading to a better return now. 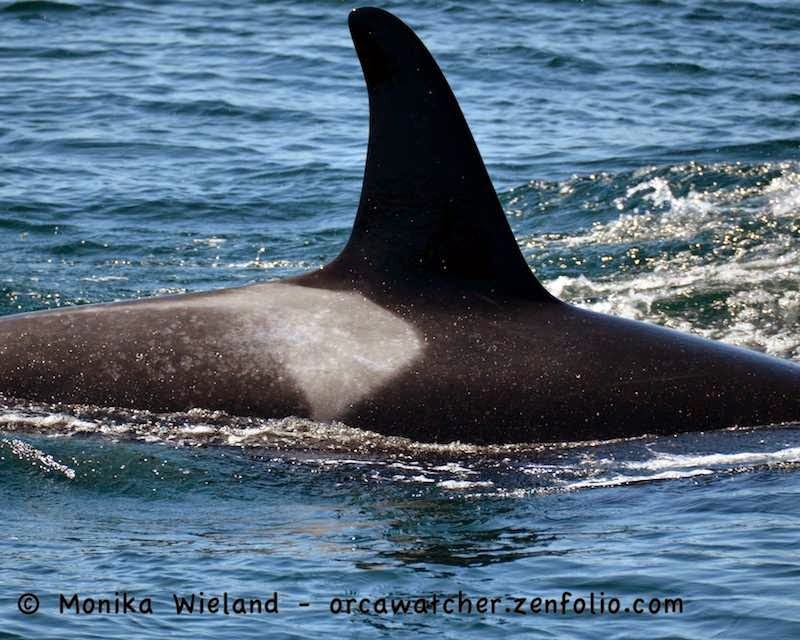 So while that means slightly more for the whales to eat now, it's pretty scary looking at what the next three years are likely to bring. The numbers barely register on the chart from 2011-2013, but seemingly random spikes like those in 2003 show that the unpredictable can happen. 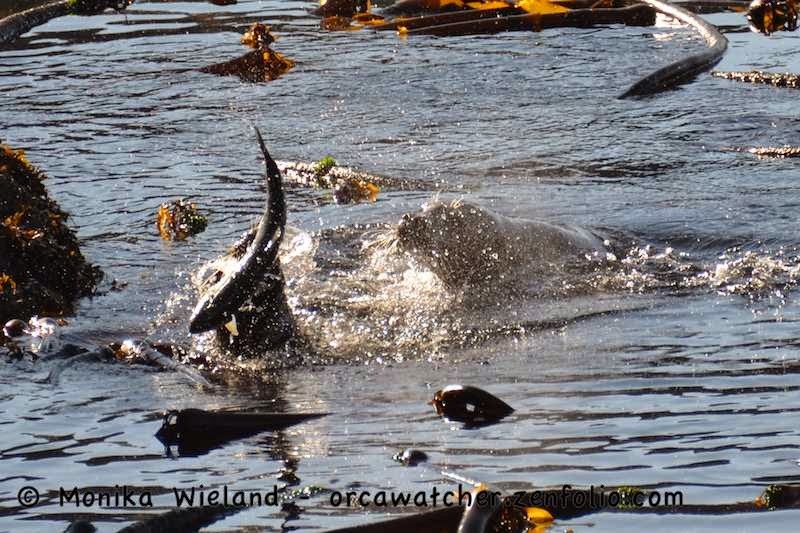 It all depends on the oceanic conditions the juvenile salmon experience while they're growing up, as well as a host of other mostly immeasurable factors. 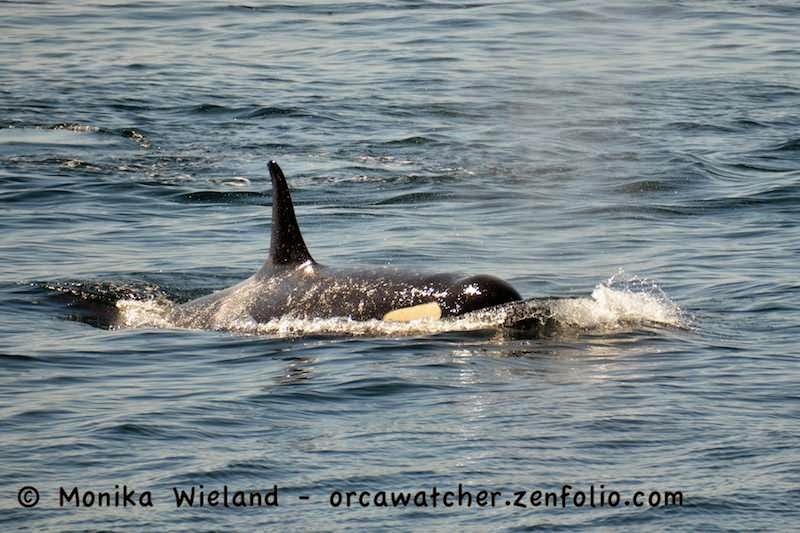 It won't be too long before it's time to crunch July numbers too, but for now, here are some photos from another whale encounter back on July 18th. 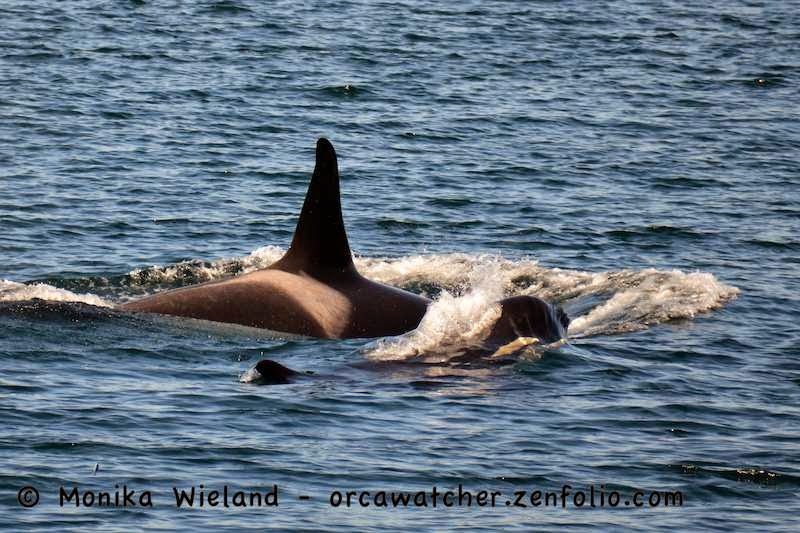 I was out at Lime Kiln when K-Pod and part of J-Pod made their way south. 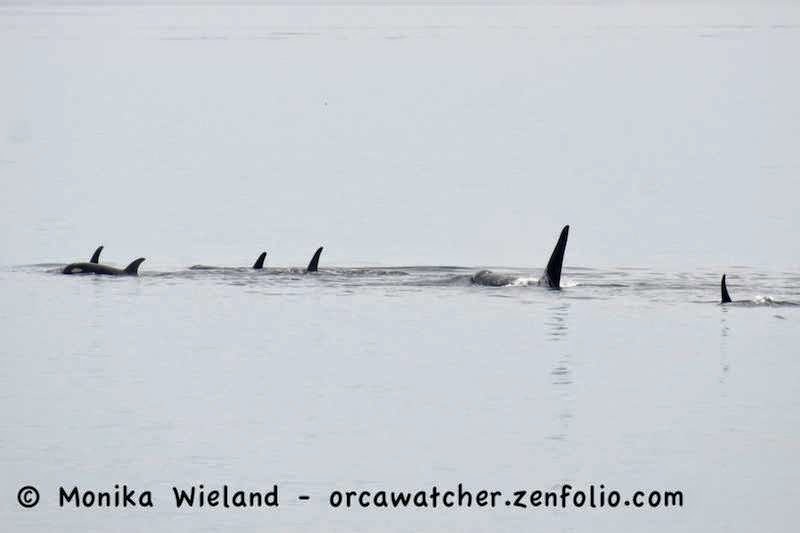 These whales were making their way down from the Fraser River, a large group of L-Pod had been doing the westside shuffle, and the rest of Js came down Rosario and were rounding Lopez. Got all that? 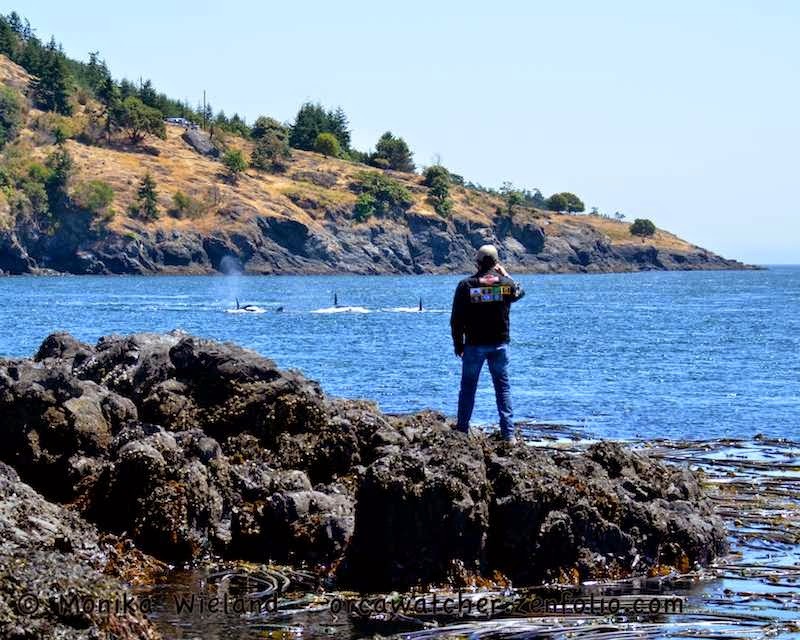 The stage was set for all the different groups to meet up somewhere off the west side of San Juan Island...but where was it going to happen? South of Lime Kiln, by the looks of it. 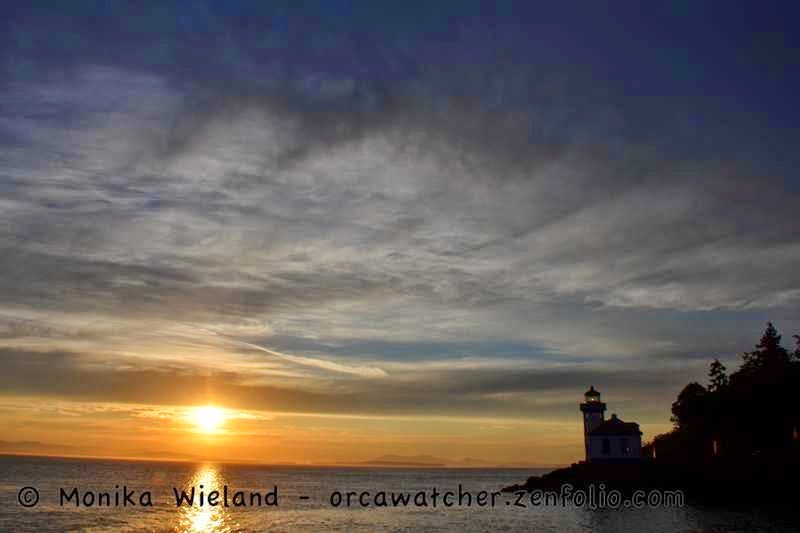 I watched through binoculars, and could see whales appearing from the south to meet the ones that had just passed us. 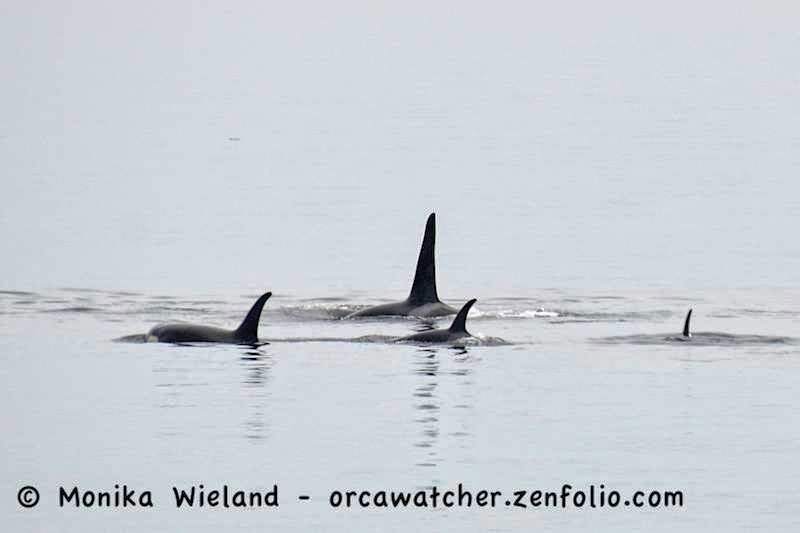 Hopeful to get a glimpse of the meet-up, I went further south too, and was rewarded with seeing lots and lots of dorsal fins near Hannah Heights. 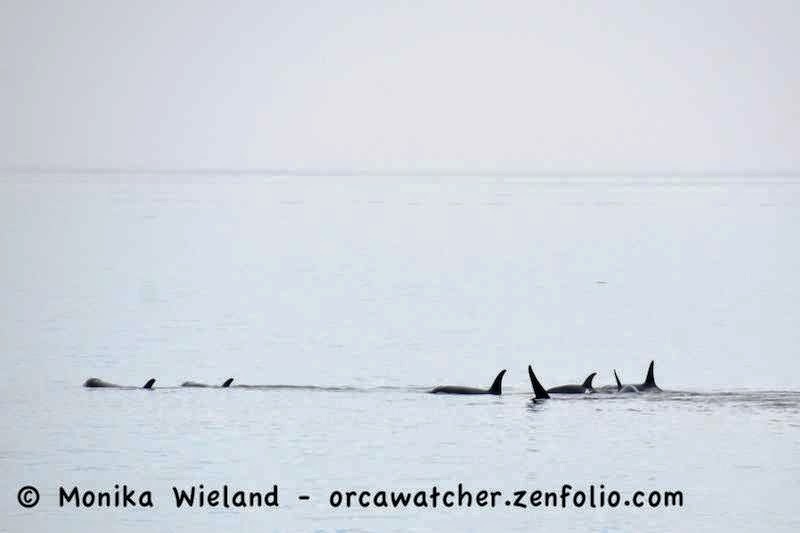 In this group appeared to be mostly L-Pod whales, almost in a resting group as they were surfacing slowly all together with long dives. 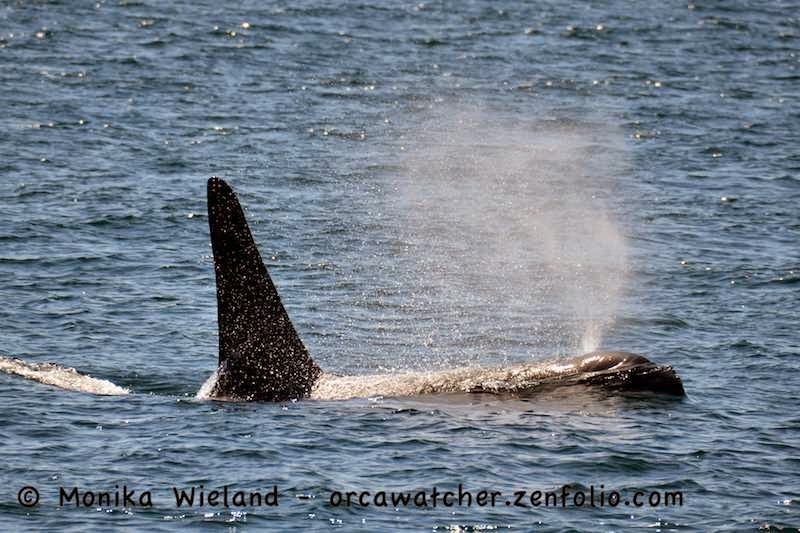 The whales swam IN to Kanaka Bay, apparently not fully asleep as several were completely covered in kelp! 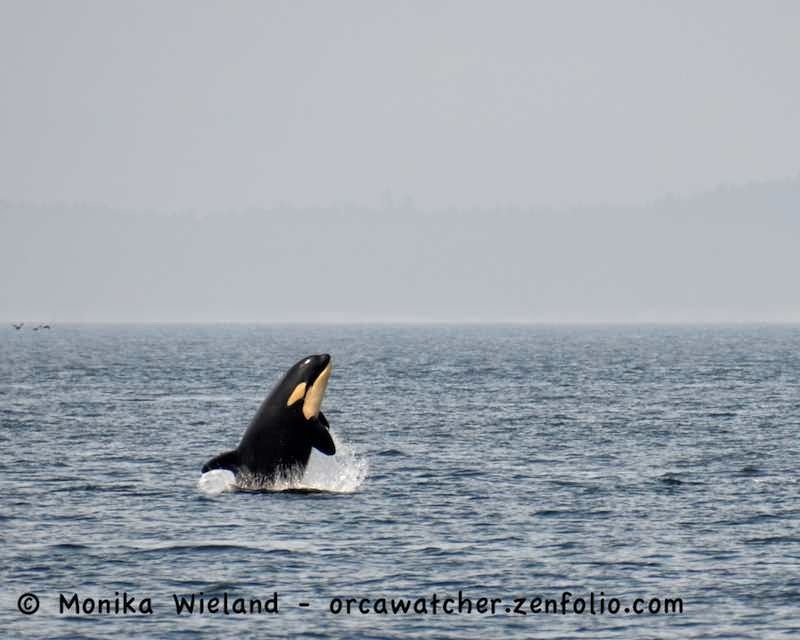 The whale sightings have been a bit thin for me since then - after weeks of being in the right groove, my timing has been a bit off, and all the residents have been out west for the last few days. I'm hoping all that changes this weekend!